WHY would a company with a turnover of Rs 9,712 crore and profits of Rs 933 crore want a research loan of less than Rs 10 crore from the government? 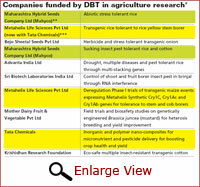 Ask the Department of Biotechnology (DBT), which has become venture capitalist to well-heeled industry. In a novel scheme that turns several concepts on its head, DBT is providing half the project costs, loans at giveaway rates and hand-holding to boot—all to encourage cutting-edge research in agriculture, healthcare and energy. It is also throwing open the expertise of the public sector organisations to companies, some of whom are acknowledged leaders in their field. All these goodies come from the Biotechnology Industry Research Assistance Programme or BIRAP, a special partnership created by DBT with ABLE, the representative organisation of the biotech industry, and the public sector Biotech Consortium India Ltd (BCIL). With a kitty of Rs 350 crore to disburse during the 11th Plan, DBT says it expects to promote “innovation, pre-proof-of-concept research and accelerated technology and product development” in the areas of agriculture, health and energy. Such projects are being kick-started on the Biotechnology Industry Partnership Programme (BIPP), and DBT has had an impressive haul so far: Maharashtra Hybrid Seeds Company or Mahyco, Tata Chemicals, Metahelix Life Sciences and Advanta India of the United Phosphorous Group (see table). 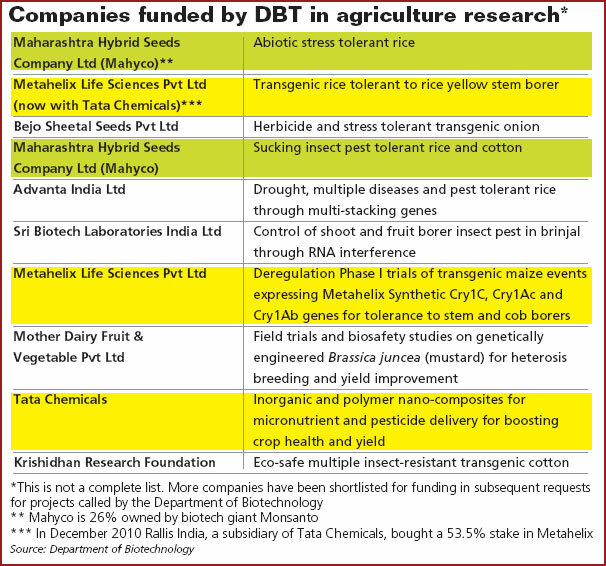 Maharaj Kishan Bhan, secretary, DBT, told Down To Earth that the dozen-odd agriculture projects selected for funding so far are intended to discover novel genes that would provide resistance to pests and diseases, and tolerance to abiotic stresses. “Our genomics is targeted at those problems that are beyond the capability of even the best managed agri-systems,” he says. IN a special programme to help industry, the Department of Biotechnology (DBT) has created Biotechnology Industry Research Assistance Programme or BIRAP, in partnership with ABLE, the representative organisation of the biotech industry, and the public sector Biotech Consortium India Ltd (BCIL). For this, government has sanctioned Rs 350 crore to be disbursed during the 11th Plan. DBT advisor Renu Swarup, who heads BIRAP, says it expects to promote “innovation, pre-proof-of-concept research and accelerated technology and product development” in the areas of agriculture, health and energy. Thus, the funding, which is for roughly half the project cost, is not provided like an annual budget; it is milestone-oriented. The milestones, she says, can be set for six months or a year. If the project does not achieve the first target, the next tranche of funding is not released. Nearly 80 per cent of the funding is provided as grant in aid and 20 per cent as soft loan at 2 per cent simple interest. The big draw indisputably is the expertise available with DBT, “the complete mentorship we give them”, says Swarup. The easy terms of finance are clearly not the major attraction for companies that have leapt on to the BIPP platform. Tata Chemicals, for instance, is flush with funds. In 2009-10, it posted a standalone income of Rs 5,670 crore and profit of Rs 588 crore, while the consolidated figure (inclusive of subsidiaries) was a whopping Rs 9,712 crore of revenue and Rs 933 crore of profit. With its subsidiary Rallis India having taken over the Bengaluru-based Metahelix Life Sciences in December, Tata Chemicals has three projects under BIPP. Its own project on inorganic and polymer nano-composites for micronutrient and pesticide delivery is among the high-risk enterprises and it needs DBT support for many reasons. “Working through government-funded programmes such as BIPP provides a means of de-risking investment in ‘proof of concept’ projects,” says Murali Sastry, chief innovation officer of Tata Chemicals. This is proving to be a red rag to many scientists. Plant geneticist Suman Sahai of Gene Campaign, which sees seed patents as a threat to food sovereignty, says, “The whole idea is crazy since the government is giving financial and technical support to industry which also gets to keep the IP rights. How does it help the nation to divert public funds to the biotechnology industry which is notoriously reluctant to make its finding and data public?” she demands. DBT’s argument is that the funding comes with a string attached: all grants have to be returned in the form of royalty, says Swarup. But the funds itself are not the issue since no project, she says, will get more than Rs 10 crore. What could be a ticklish point is the opening up of public research institutions and experts to the private sector. All the beneficiaries, big and small, stress the technical expertise offered is the biggest draw in BIPP. Sastry says platform for networking and partnering with government institutes and academia is a big benefit. And there is the matchless opportunity for mentoring on a range of issues. The much smaller Bejo Sheetal Seeds of Jalna, Maharashtra, which began working on herbicide- and stress-tolerant onion in March 2010, cites the “technical knowledge of experts” as a major incentive. In the case of Mahyco, managing director Raju Barwale says BIPP provides an opportunity to work with DBT “in critical areas where technology interventions can positively impact crop productivity”. Abiotic stresses such as drought and salinity, and sap-sucking pests are major constraints in rice and cotton, he points out. Funding sanctioned for these two projects is about Rs 2 crore each, which may not make a big difference to Mahyco (revenue: Rs 220 crore in 2009-10). But even a company which introduced GM cotton in India and developed Bt brinjal, may need the vast expertise on rice available with the public sector research institutions. Besides, as one expert pointed out: “These are only preliminary figures of funding. Projects of this nature take at least a decade to get results, so costs are going to be much higher.” In the case of Metahelix, which is working on transgenic rice and maize (costing a little over Rs 6 crore), managing director K K Narayanan says the DBT platform “is a good PPP mechanism to support innovation”. While companies are gung ho about this, others are none too happy with the underlying philosophy of the scheme which reflects the DBT chief’s views. An incensed stalwart of the public sector, P M Bhargava says this casts a slur on reputed institutions like ICAR, CSIR, IARI and state agriculture universities. “If DBT means no public research institute in India is capable of doing successful research, let’s wind up everything and let private industry handle it. Shut down all the premier research institutions, even the Department of Atomic Energy and DBT itself,” fumes the former director of the Centre for Cellular and Molecular Biology. But that clearly will not happen. The private sector needs these institutions far too much. How competent is Indian science? Advanta is a Rajju Shroff company. Connect the dots. The comments under the title Ã”Ã‡Â£Biotech Industry has a New PatronÃ”Ã‡Ã˜ focus some of the immediate concerns and hotlist a few of the opinions by the authors (Jishnu & Sood). An article expressing the apprehensions on the indent of multinationals to enter the Indian food production programme by Ms Suman SahaiÃ”Ã‡Ã–s in The Tribune (March 17) also dilated some of the salient features penned down by M/S Jishnu & Sood. Before I write on the views of aforementioned authors, I would like to reproduce my letter, written in response to the write-up of Ms Suman (Published, Tribune; March 27) since it amplifies the topic further and gives a scope for additional comments to the present article later on. It reads, Ã”Ã‡Â£This refers to Ms Suman Sahi article under the title Ã”Ã‡Â£Corporate food savioursÃ”Ã‡Ã˜ and pertains to the corporations, belonging to the consumer industries community of the World Economic Forum, announcing their intention to enter the food business from GM seed to the grain production in a holistic way which by all means should be considered as a progressive step especially with regard to GM technology. These innovative developments hold a lot of promise for a developing economy like ours. It is time for all of us to have a panoptic view that modern methods of agriculture are perhaps providing 80 per cent of the theoretical yield and a transgenic technology can only push it up to 90 per cent in developed countries. On the contrary, we are at 30-40 per cent productivity levels and any technology that can push up the yields, say to 70 per cent, would have a tremendous impact in transforming our agricultural sustainability. The writer (Ms Sahai) expresses apprehensions that the multinationals will rob us from our indigenous resources. When will the time come when we will have the confidence that our scientific personnel who are our guardians with the arsenal of the knowledge and expertise, can sift the grain through the chaff and can point out what is relevant to excellence for our country? After all the story of green revolution revolves around the well knitted international collaboration. The need of hour is to accept the GM technology. We have to assess what is relevant to our land and lab, have faith in our scientific community and have an innate confidence that nobody can rob usÃ”Ã‡Ã˜. Similarly, in the article in Down to Earth the authors question the proposed symbiotic venture capital plans of the Department of Biotechnology, Govt. of India in collaboration with some multinational companies. At present the ClarionÃ”Ã‡Ã–s call is to accede to the progressive policies in agriculture rather than evade them for petty gains. We should feel proud at the successful model being adopted by the Department of Science and Technology, Govt. of India under the head -Industry Partnership Programme (IPP) - for the development of instrumentations in the last decade and half. Under IPP agenda liberal funds were granted to research institutes in partnership with the industries which in turns proved to be a harbinger of success relevant to excellence in sensor instrumentations with industrial/defence/or export houses. Further in the comments, there is a question mark to the amount of grant to these multinationals which otherwise are very well off. The spirit of the venture is to work hand in glove with anyone who is transparent, thinks globally acts locally and is capable of mutual trust, without forgetting to keep our own national bio-surveillance on its toes concurrently. As public scientists and educators, we are struck and deeply concerned by the poor state of literacy among the wider community. Of course molecular genetics is a complex field, requiring specialized training to comprehend fully and not blame the biotechnology department or a multinational company for keeping their findings secret and subsequently label it as notorious. Let us take a leaf from the world of medical biotechnology which is ruling the roost and where intrusion of recombinant DNA technology engenders little or no public concerns at all. If there were something inherently hazardous with the process of GM technology, then these pharmaceutical products would just as suspect, perceived as just hazardous. But they are not. Let us not put a stumbling block on the process of thinking of these executive agencies rather be catalysts to the dreams of those who plan it with a vast knowledge of experiences and after taking into account different models which might have worked successfully indigenously or at abroad and let us have a mid course appraisal and/or at different milestones which are also enshrined in this present venture capital model.